One of the tricks when buying a used car is that you should always pick the example with the most options from the OEM. Those options can add up to tens of thousands of dollars on a modern luxury car, but you'll often get them for free when you pickup a used example because everybody looks at KBB and the options don't make much difference. What about on an older classic? The same principle applies, except that sometimes a low optioned car has a certain appeal...but how low can you go before it just becomes ridiculous? 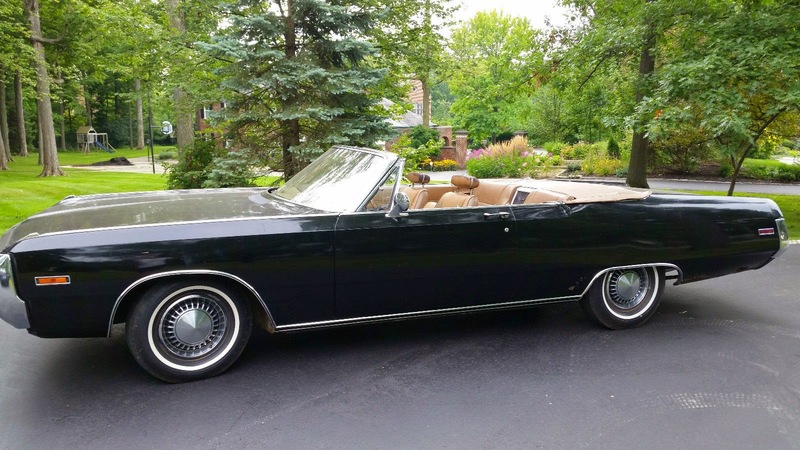 Find this 1970 Chrysler Newport Convertible currently bidding for $5,000 here on eBay located in Flint, MI. 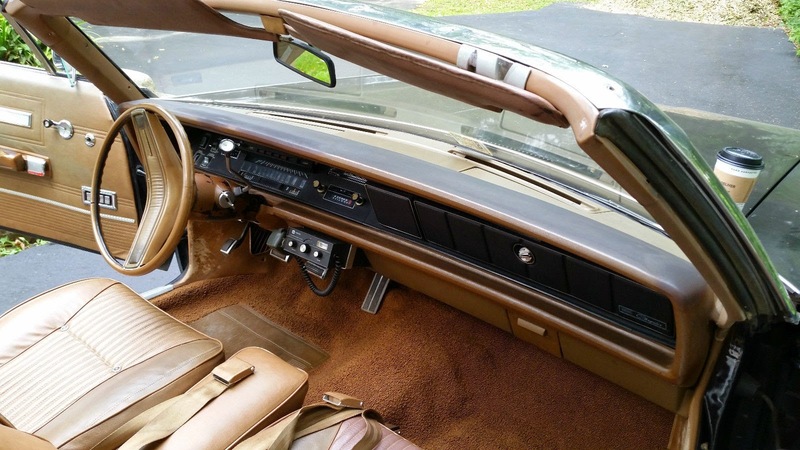 This Chrysler Newport is not only powered by the most basic V8, but it is also shifted with a 3-speed on the tree manual...however it gets the ultimate stripper title because it has manual steering and manual brakes, plus a radio delete option. The 2bb fed 383 cubic inch V8 is good for 290 horsepower and 380 ft-lbs of torque -- which isn't much to push around the 4300 lb curb weight, a majority of which will be placed directly over the non-assisted steering box. Turning radius is a moot point when you physically can't turn the wheel from a dead stop....but perhaps you'll never reach a dead stop with manual drum brakes. Oh my gawd. This one is the result of a unicorn mating with a jackalope, I think. The driving experience must define the term "execrable". 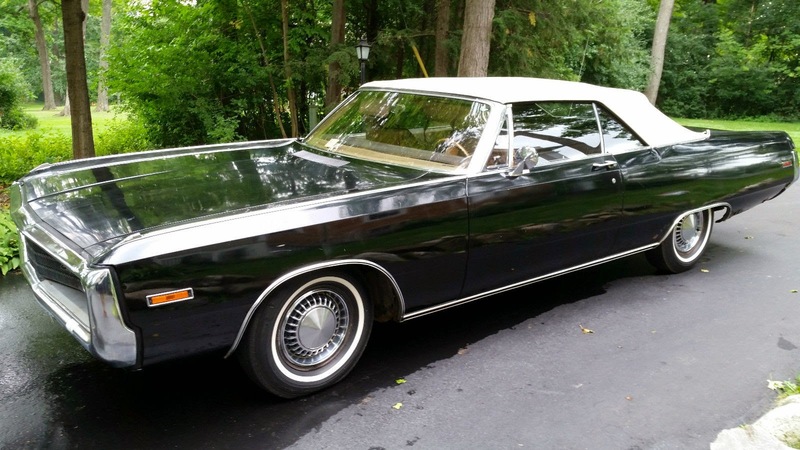 I know I have told this story before, but when my late father bought his one and only new car, a 1969 Ford Torino, he was a relatively sprightly 56 years old. So he eschewed all the power options (steering and brakes, most notably). He still had that car 25 years later, when he was 81. He could no longer park the thing. Oh, and of course no power brakes also meant 4-wheel drums on a 4,000 lb sedan. That was fun too. So kiddies, make sure you fill out that option sheet carefully. You never know what life has in store for you. The featured car looks like a good starting point for a Wheeler Dealers style "uprating" project: adding power steering, modern disc brakes, better dampers, and oh, maybe a 5.7L "HEMI" engine swap from a newer Charger or something. Calling Vince & KBZ: we need a Stripper badge!!! Yeah, at least with this thing when you start on the restomod project you've got a lot less old cruft to remove. Bet the old geezer who ordered it was probably one of those "it's safer to be thrown out of the car" anti-seatbelt types too. I thought this stripper was a dealer's ad-car until I saw the power windows, which made me wonder. However, being a convertible (and unfamiliar with Chrysler's standard features) I'm wondering if the convertible top came standard with power windows to prevent someone from actually trying to reach the right rear window from the driver's seat, which in this car would be a feat for even (fill in the name of your favorite 7-ft + bball player). Stripper cars are as old as the auto industry and were typically ordered to serve as the advertised special cars for those "As Low As" prices. Depending upon where they were located, they would have to pull the ad if they didn't have one in inventory so...they made it very clear to the salesmen that they'd better be a good enough salesman to talk someone out of the 'ad car' and into something with more equipment. Typically, the cars would be ordered in unbelievably ugly color combinations to repel potential buyers. This one was probably ordered by a more shrewd dealer who, rather than hiding it under dirt in the farthest corner of the lot, would have displayed it prominently on the front row so passers buy could see it with the top down and that cheap price plastered all over the windshield. Or stand proudly next to it for their TV commercial. If this car doesn't make you miss Cal Worthington, nothing will! Cal Worthington...and his good ol' dog Spot! That takes me back. Nice one. My first car was a '58 Mercury, 383 V8, but not much else. Manual steering and manual drum brakes, with a steering wheel that looked like it came off the Sloop John B. Thing nearly killed me several times, either trying to stop or trying to turn unexpectedly. Buyers of this car can expect the same. Nothing to add re the featured rig. I only wish to lend my voice to the collective call for a Stripper badge; all designs to be evaluated and approved by me, of course. I don't know what a "stripper badge" is. Is it something like a butterfly tattoo on her lower back? When Lee I. took over Chrysler he said this was a real problem that a lot of cars were ordered with no real common sense of equipment this is a perfect result of a car company running off the tracks and nobody gives a crap.